Selecting the right school for your child is a big decision, and we know you want to choose a learning environment that offers the best opportunities available to your child. 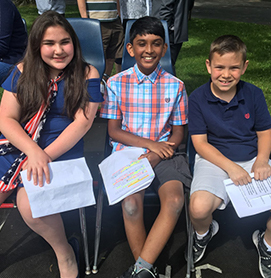 We know you’ll be very happy with the educational experiences you’ll find at the Ridgefield Public Schools. Please allow us to share some of the reasons why our school is the best choice for your child’s future. We care about each student and are dedicated to providing an education that allows all of our students to succeed. Our highly qualified teachers work with students in a small class setting that allows them to personalize their teaching strategies. We also offer a full range of support services and program offerings that enhance student learning. We proudly offer a challenging academic curriculum supplemented with a variety of extracurricular programs and services that enhance the student learning experience. Students have the opportunity to participate in activities such as athletics and fine arts (including art, band, music, and chorus). Our goal is to prepare students to meet future challenges and enjoy successful college and career experiences.